In order to make one of the most important days in your life special and stress-free, it’s important to gather all the necessary items that will take your event to new heights. Choosing the right activities, entertainment, food and décor will both wow guests and deliver the wedding that you always imagined. About 16-9 months before your wedding date, it’s important to book your venue, choose your bridal party, and work on the guest list. Once that is done, it’s time to start planning the accouterments. And that’s the fun part, right? Starting the process about 8 months before your date will give you plenty of time to organize, without any added stress. Here are 5 services to set up ahead of time in order to make your wedding a huge success. Almost as important as enjoying your special day is capturing it on film. Preserving memories of exchanging vows, break-dancing, and goofing around with friends and family will remind you of your support system. Research the costs, styles and portfolios of potential photographers and videographers, and choose one that fits your budget and visual preferences. Decide if there are any particular shots or locations you would like to feature. You can also ask your venue if they have any suggestions based on previous events. While the ceremony is the reason we put on our best suits and dresses, the food is definitely something all guests look forward to. Check your budget to see whether a sit-down dinner or buffet is more plausible. Figure out how many courses you are able to have, as well. For instance, a higher budget could allow for a pasta, a salad, and entrée, while a tighter one might allow for just one appetizer. Also, have fun tasting! A little bit of steak here, a bite of salmon there, and a sip of red wine to wash it all down. Don’t forget a vegetarian or gluten free option for a sit-down meal, as you’re bound to find requests. And of course, don’t forget dessert! Wedding cake? Cupcakes? Dessert Bar? All of the above? Feel free to get creative: a chocolate fountain with dipped fruit, DIY cake pops or ice cream bar, or even a s’mores bar—just be careful with any flames! It’s also a good idea to ask your venue if they have a catering service that they work with, as that can make for an easier, reliable, and perhaps more affordable, experience. As for cocktail hour, discuss the budget with your partner. Decide whether you can afford an open bar, instead of a cash bar or a single featured drink special, and how many passed hors d’oeuvres you can serve. Selecting your flowers is critical to setting the atmosphere and mood. Discuss with the venue about the placement of flowers. How best can you showcase them? As table centerpieces or scattered throughout the room? Also, if you plan on providing guests with favors, such as wine glasses or monogramed cookies, you should schedule those pieces about sixth months in advance. Even if you are not planning a “destination wedding,” there’s bound to be several out-of-town guests that are flying or driving in to share in your experience. Make it easier on them by securing a block of rooms at a nearby hotel. Likewise, it’s best to provide choices. Pick three hotels that range in price so that there is a place to stay for everyone, no matter the price point. Try and secure the best deals with the hotels that you can find. If your venue is at a hotel, you might also be able to work out a special package. Figure out the placement of tables, chairs, lighting and entertainment within the venue. Once your entertainment is booked, figure out the proper schedule and logistics of the performance. Did you hire a band or a DJ, and what might they need from the venue on the wedding date? Are you entertaining guests with other shows, such as magic, acrobatic or dance performances? Think about spacing and the guest list. Will you need extra chairs? What type of lighting might you require? You should also figure out transportation ahead of time. A bus to transport guests from hotels to the venue would help guarantee that your guests arrive on time. If you can visualize your wedding and all of its parts, and relay that image onto the venue staff, it will make the event date smoother. 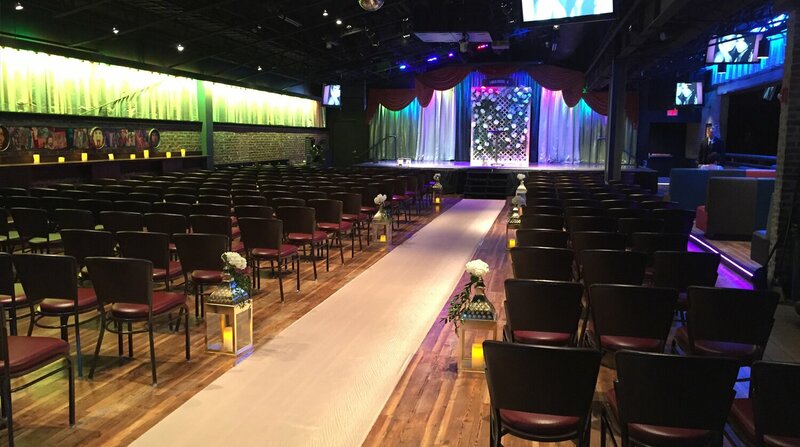 Ready to start planning your wedding at Viper Alley? Contact Viper Alley at 847-499-5000.